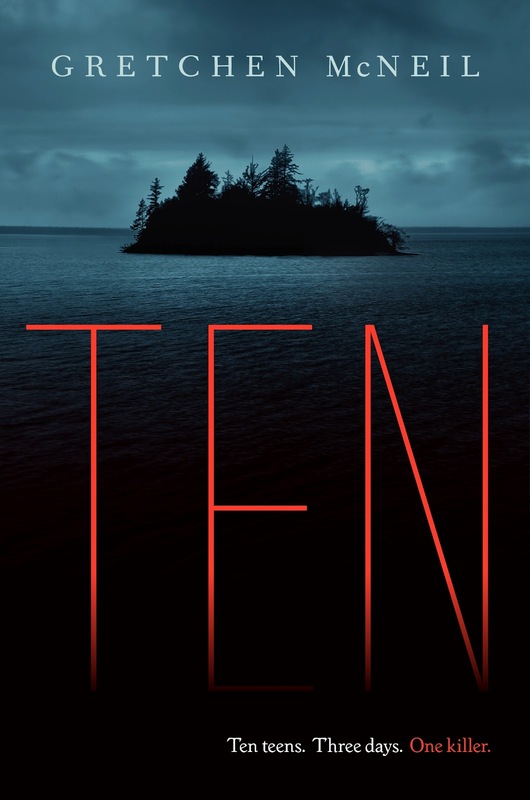 TEN by Gretchen McNeil is the perfect throwback to a type of teen horror that was popular in the eighties and nineties--it’s not supernatural or sentimental; it’s not overly gory or deeply psychological. TEN promises and delivers that pure roller coaster, thrill-a-minute, watch-your-back, killer-on-the-loose, didn't-see-that-coming kind of horror. And it's fun. Somewhat based on Agatha Christie’s classic AND THEN THERE WERE NONE (which has an interesting history behind it, having been published originally as TEN LITTLE NIGGERS in the UK and later, TEN LITTLE INDIANS in the US), McNeil's TEN follows Meg, a bright introspective girl who’s always been tasked with putting the feelings of BFF Minnie ahead of her own. When the two of them head out to Henry Island for a weekend-long party with eight other teens and no adult supervision, Meg is torn between wanting to keep the wild Minnie under control and exploring her romantic interest in handsome football star, TJ. However, hookups and partying soon fall by the wayside as the body count begins to pile up, and Meg must solve the mystery behind a vengeful killer before her own number is up. Once the first body is discovered, TEN is non-stop action (and non-stop death). McNeil does an excellent job pushing the pace along while managing a sizeable cast of characters. The dialogue is snappy and smart, and the clues, red herrings, and mystery behind the killer's motives unfold in a creepy, satisfying way that keeps you guessing to the end. Ooh this one sounds exciting, I'm going to have to keep a look out for it! I've had my eyes on Ten for a while so I'm glad it'll be released soon! I love the sound of it and the idea that it's a take on The Agatha Christie novel! This sounds amazing :D I loved the novel it´s based on...Pre-ordered! I've had my eye out for this one ever since I saw the premise. Awesome! Of course, having read the Agatha Christie version, I'll have an idea about the ending in advance ... but it will be fun to see if it's resolved the same way. Oh this sounds good. I'm going to preorder it now.